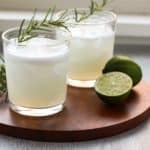 August 7, 2018 By Liz 3 Comments Note: This post may contain affiliate links. 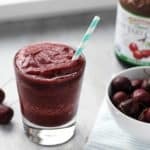 This chocolate covered cherry smoothie is a delicious balance of sweet and tart flavor with a hint of chocolate. 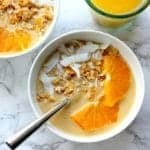 It’s the perfect drink to sip as you start your day or recover after a workout! Lately, I’ve been working out in the morning. THE MORNING. I never, ever thought I’d be a morning exercise person, but here I am. It’s only been a couple of weeks so I can’t say for sure if it’s going to stick, but it’s going pretty well so far! I’ve been doing circuit-style workouts so it only takes about 30 minutes and it’s been really nice to knock it out as soon as I wake up. Last week, after my morning workouts, I had this smoothie as a way to cool down, hydrate, and fuel me until lunch. 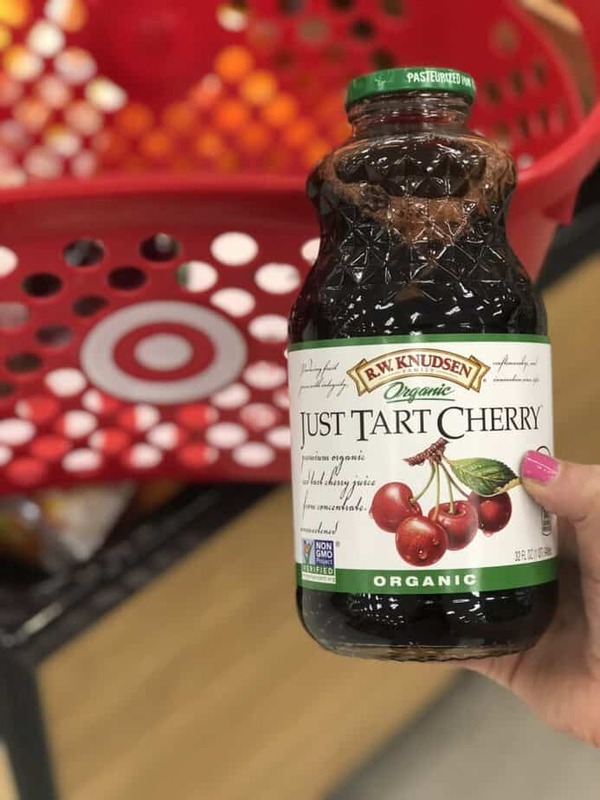 It’s quick and easy but I’m loving the sweet-but-tart cherry flavor. I picked up a couple of bottles of these Organic R.W. Knudsen Single Fruit Juices from Target. They’re non-GMO & organic with no artificial flavors or preservatives. Plus there’s NO ADDED SUGAR. Can we say that again? So many fruit juices on the market are like 10% juice and 90% sugar. Not this stuff! So it makes a perfect smoothie base! 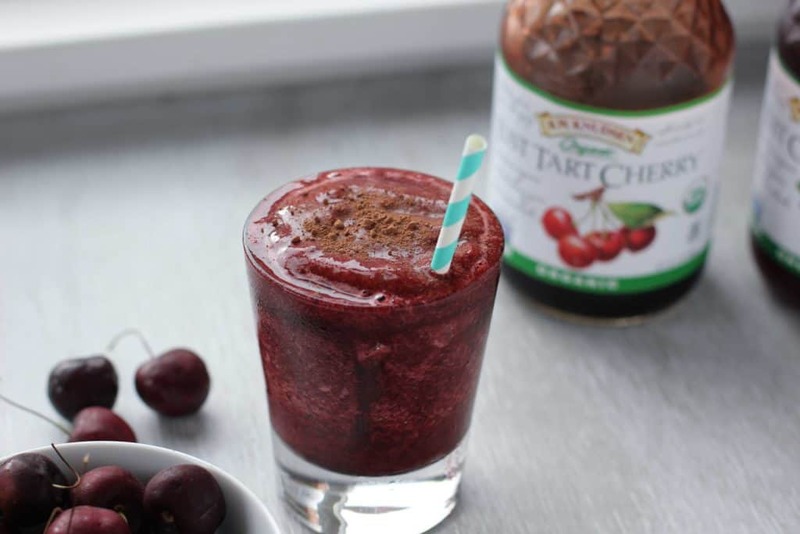 If you love chocolate covered cherries, this smoothie is for you! 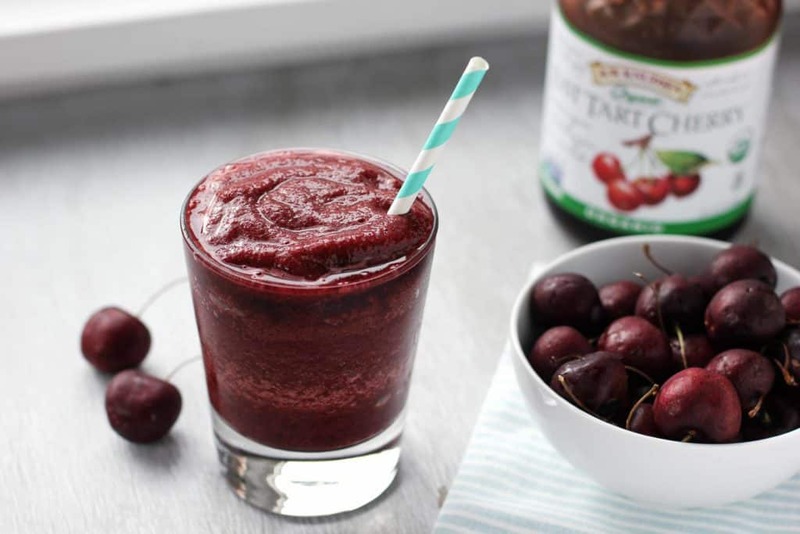 This chocolate covered cherry smoothie is the perfect balance of sweet and tart flavor with a hint of chocolate. 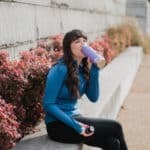 It’s the perfect drink to sip as you start your day or recover after a workout! 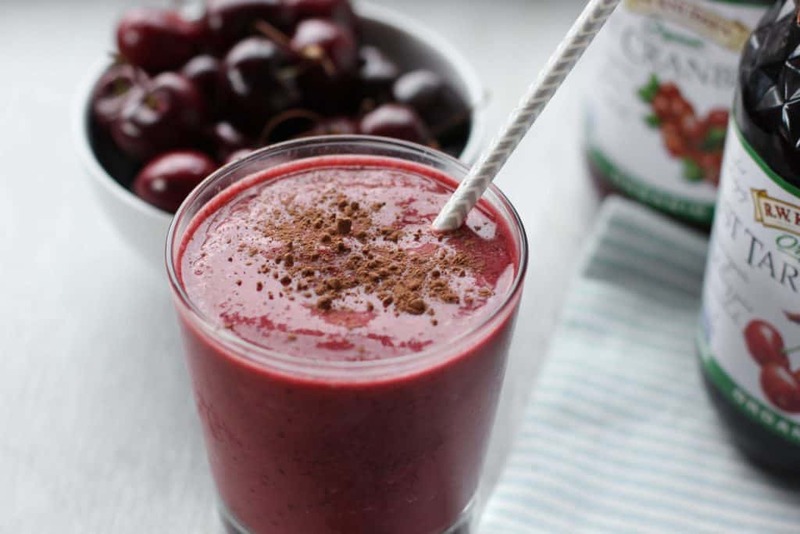 Add the cherries, yogurt, cherry juice, ice and cocoa powder into a blender. Blend until completely smooth. Sprinkle with additional cocoa powder, if desired. Be sure to look for unsweetened frozen cherries, to avoid added sugar. 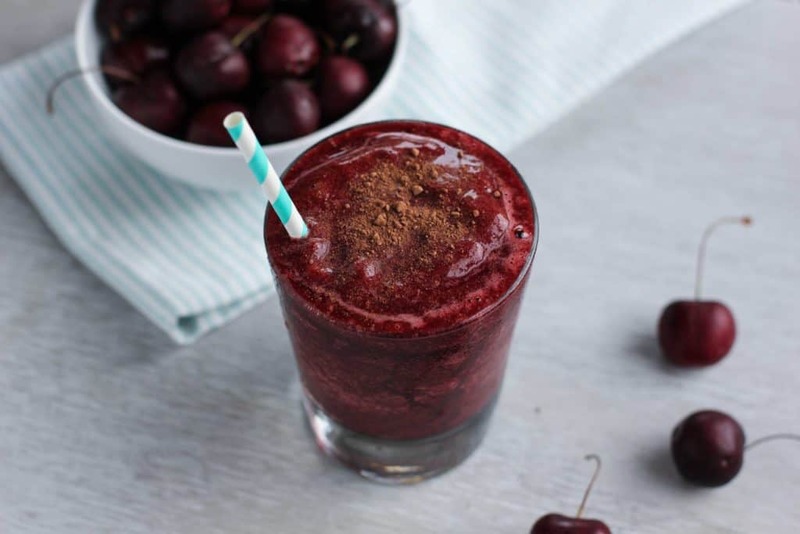 This chocolate covered cherry smoothie tastes like a summer slushie! 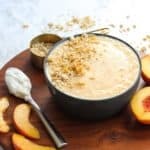 While I love smoothie bowls, lately I’ve been enjoying smoothies that I can sip through a straw on my way out the door. I feel like I’ve been running in a million directions lately, so it’s helpful to have a breakfast I can enjoy on the go! On Thursday, I put this one in a to-go cup and sipped it on my drive up to Northern Virginia last week. It kept me powered through a busy morning of meetings without my stomach growling! R.W. Knudsen also makes organic pomegranate juice and yes, it’s also delicious. I haven’t put that one in a smoothie yet but I’m thinking it would be delicious in a tropical smoothie with pineapple! I snagged both of these at Target and you can save 25% with this coupon if you have the Target Cartwheel app! But let’s be honest, do you really need an excuse to go to Target? If you need me, I’ll be in the throw pillow aisle. Yum! I make a slightly different version of this for after my workouts! I’ve been going at 5:30 am this summer vs my normal 9:30 during the school year! It is rough but my smoothie helps get me through! I add a little spinach, banana and turmeric also to help me recover from those early morning gym sessions! Chocolate & cherries is one of my favorite flavor combinations! Great idea.